United Kingdom go provide food to 1.5 million people, and give treatment with medicine to 20,000 children wey fit die as dem no see food chop. Na Foreign Secretary, Boris Johnson, talk dis one as part of humanitarian programmes wey di country go roll out for Nigeria from 2017 to 2022. Mr Johnson talk dis one for statement as e visit Nigeria with UK International Development Secretary wey be Priti Patel. Dem waka come check how UK dey lead world response to the palava wey fight-fight and terrorism from Boko Haram don bring to north east Nigeria. On dis their first visit wey dem do together, di Secretaries enter Maiduguri, Borno State, and dem hear how di British military don dey train Nigerian soldiers wey dey enter battle ground to fight Boko Haram. So far, UK don train pass 28,500 Nigerian soldiers for different areas like counter-terrorism cooperation, how dem dey respond to terrorist attacks, how to manage bomb scene and even how to dey safe for sky, wey be aviation security. Mr Johnson say: "for Maiduguri I meet those wey don suffer Boko Haram violence, including bomb and gunshot victims dem; I take my eye see how fight and poverty don chase people comot their own home." 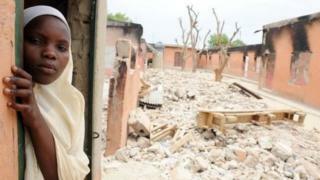 Parts of north east Nigeria don destroy well, well after plenty attacks by Boko Haram. Di militant group don kill pass 20,000 people, chase up to 1.7 million people comot from their house, and dem still leave like 8.5 million people wey need help quick-quick, sotay some case dey where hunger wan kill innocent people. Meanwhile, Boko Haram dey bomb dey go, and now dem don even begin force pickins to carry suicide bomb for bodi wey go kill people, and kill di pickins sef join. Na for dis visit Ms Patel still open mouth, talk more about di plan wey go help Nigerians. Support go continue to help make sure say 100,000 girls and boys remain inside school, and dem get better education. UK go still provide safety to make sure say aid workers go fit reach and help those wey dey area where fight-fight dey go on. For example, dem go use helicopter take fly pass any place where road dey blocked, or dey too dangerous to use. Miss Patel say: "Britain no go turn her back on top people wey dey danger; we dey lead the way for world on top defence and diplomacy matter. Terrorism no dey stay inside one country, and Nigeria government suppose follow our lead, so dat innocent people no go dey die anyhow." Mr Johnson still talk im own: "Boko Haram don bring plenty suffer-suffer, fight-fight and poverty sotay the palava their attacks dey cause don reach pass Nigeria border. I dey proud of how Britain don put mind to support Nigerian people wey dey fight terror." Di £200 million support wey dem announce dey come from di Department for International Development (DFID) budget for Nigeria wey go cover four years, from 2018 to 2022. Dis one go join di £100 million of humanitarian support for 2017 wey International Development Secretary Priti Patel announce early dis year. Di programme go reach Nigerians through partners wey include di International Committee of the Red Cross (ICRC); United Nations agencies like UNICEF, WFP, United Nations Humanitarian Air Service; other international NGOs, and private sector partner dem too. E pass 40 UK military people wey dem don dey send to Nigeria regularly. Till now, e don pass 28,500 Nigerian military workers wey UK don give training.